Our washing machine was not appreciated. It faithfully sat in the corner of our laundry room and dutifully agitated and spun the dirt away… until it broke last summer. It had served us well by cleaning 60 loads a month, but it was not worth repairing. This was our unplanned introduction to off the grid washing and putting into practice the skills needed to clean clothes without electricity. No one, except me, was enthusiastic about this new adventure. For two weeks we did our laundry by hand and lived to tell about it. We knew enough of the basics and we did have clean clothes, but as those 2 weeks wore on, we learned a lot more. If you’re ever without power or if there’s ever a grid-down scenario, these tips will come in handy. 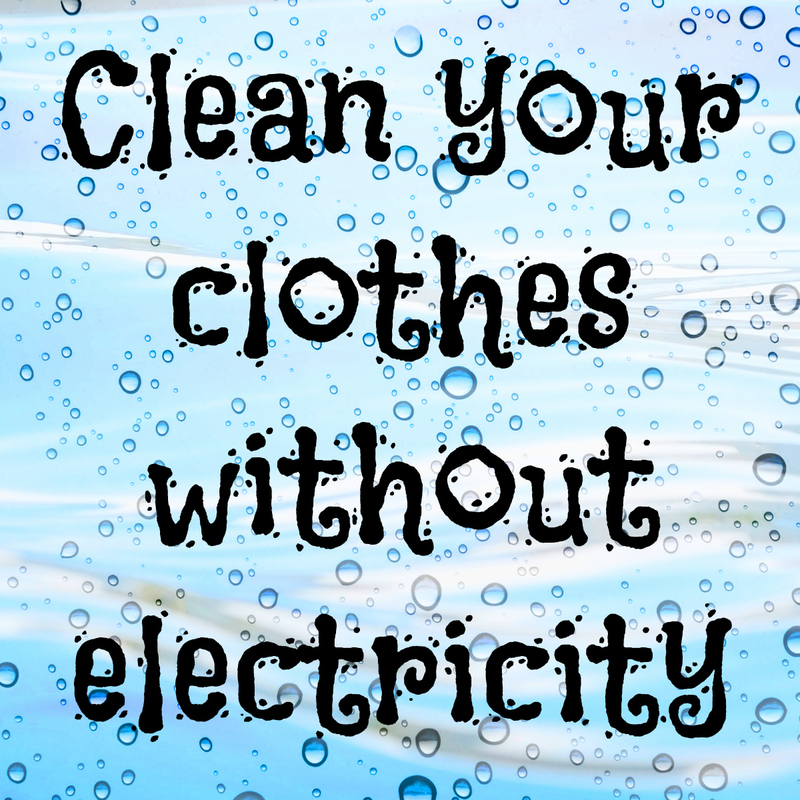 Clean clothes without electricity — not easy, but doable! • Do your best to keep up on laundry. When an emergency happens, you will feel some sense of assurance that most of your family has clean underwear. In fact, hurricane-hardened moms know to go on a laundry-cleaning marathon once a hurricane is just 3 or 4 days out. If the power goes down, at the very least you’ll have clean sheets, towels, clothes, and plenty of clean underwear! 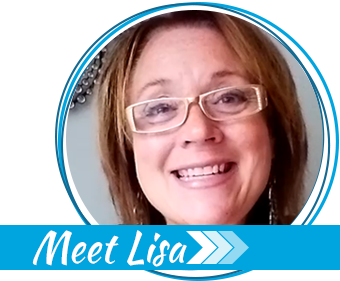 • Assign a laundry day to each person in the home. If they are old enough to, have them be responsible for their own laundry, this includes their linens. Teach and help younger children how to do laundry, including sorting, which detergent to use, how to remove stains, how to fold each type of item, and finally, where everything goes once folded. When they are 12 years old they should have this mastered. It’s a life skill. Am I right? • Stock up on laundry soap, dryer sheets, fabric softener and stain remover. A 3 month supply would be awesome! 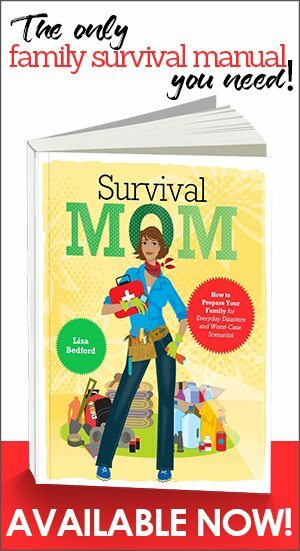 If you want to make your own products, download Switch From Store-Bought to Homemade, a FREE Survival Mom e-book! • We have stored bars of Fels-Naptha and Zote soap. These bars can serve as a pre-treatment stain remover and as detergent. 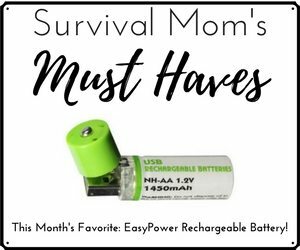 They are inexpensive, small, easy to store and last a long time. • As a bonus, Fels-Naptha can be used for poison ivy treatment, cleaning very greasy/dirty hands and household cleaning. Do not wash dishes with it or use it as a regular hand soap. • Zote is a great soap for those with sensitive skin or for baby clothes. It has a strong scent, however. • Clotheslines and clothes pins are a must. Clotheslines come in a variety of styles. Buy what works best for your home and size of your family. Be prepared to have a drying method for inside your house on rainy and/or wintery days. Wet clothes have been known to freeze solid on a clothesline! • Have a backup location to wash and dry. In Southern California we found the weather to be wonderfully cooperative! Consider the bathroom a great place to wash. You will need to drain the water somewhere. Maybe a garage or basement would provide the room needed for a clothes line. • Once in a while, wash clothes by hand or just bypass the dryer. There is much to learn about the art of hanging clothes on a line. More people than you might think continue to use a washboard for scrubbing clothes by hand. • In a true grid-down scenario or a severe drought, be prepared to recycle your grey water. Grey water is the water that you used to do laundry and can be used to water plants, wash a vehicle, or other uses that don’t involve contact with food. If you’re planning to do this, use water that has not been used to wash underwear, since any water that comes in contact with feces will be too contaminated to re-use. The solution for that is simple: schedule one or more loads of “underwear laundry” per week and wash everything else separately. • Consider buying a non-electric washing machine as a backup for power outages. These units run around $50 and the WonderWash was reviewed here a few years ago. Some of these units have a foot pedal or a hand held crank and hold about 6 lbs. of clothes. They require less physical strength and it only takes a few minutes of turning to have clean clothes. Rinsing goes fast and the clothes can be spun to expel much of the water. There are a variety of laundry soaps and stain treatments that you can make at home. I have made both the powder and the liquid. The powder is faster to make. I recruited one of my children to grate the soap to see how it would work. It went well and I got a clean smelling kid out of it. A food processor was used to grate another batch. It got the job done but it did required electricity. You could easily make a 6 month to a year supply of laundry detergent in an afternoon. Personally, I store bars of soap and have additional store bought detergent as well. Download Switch From Store-Bought to Homemade for free recipes and instructions for homemade laundry detergents. • Lids for buckets. Washing can be done without a lid, as we have learned, but a lid is better! 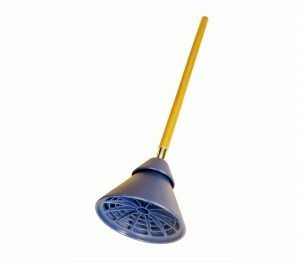 • A new plunger, average quality is the minimum.This one was designed specifically for off-grid laundry use. Take one of the 5 gallon buckets and drill holes all around the side of it. Drill holes in the rubber part of the plunger, if you’re using a traditional plunger and not the one pictured here. If you choose to use a lid, drill a hole in the lid that is large enough to place over the stick of the plunger. Put the bucket with holes inside the other bucket. Add water, soap and clothes. Allow enough room for agitation! Grab a chair, put the bucket in front of you, and pretend you are plunging the toilet for about 10 minutes. Dump dirty water out, fill with clean water and continue plunging. When you are finished rinsing, place the outer bucket inside the bucket with holes and press or sit on it. Most of the water will drain from your clothes. If you are determined to permanently wash without electricity, there are other options to be explored. A bicycle powered washing machine or a large hand cranked machine can be purchased. Antique stores and auctions often have non-electric washing machines from many years ago that are still functional. These vary in price and quality. What matters most is that you have a plan and the proper equipment ready to clean clothes without electricity. It’s not easy, but it’s definitely doable! 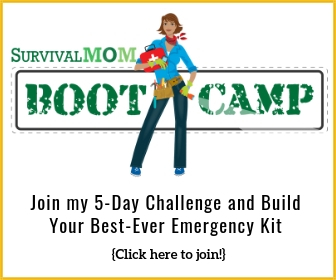 One in a Million: Would your spouse live the off-grid lifestyle? Might I suggest an old-fashioned hand-crank clothes wringer also. It’s a great addition when it comes to wringing out heavy cotton items like jeans, towels, etc. It helps the clothes to dry faster when you’re hanging them out on the lines. I read about this method a long time ago, in The Mother Earth News, I think. A cowboy said he put water, soap, and clothes in a milk can and threw it in the back of his jeep. In the course of riding around all day, the clothes were agitated with no labor on his part. Don’t know if it would work, but it suggests a useful line of thinking on the problem (wave action on a bobbing can in the ocean, for example). Want to try this – how many holes & where on bucket? A picture would be great! I have the Wonder Washer as well as the bucket for doing the laundry. This part is for the Wonder Washer plunger to fit in. A 5 gal bucket from your local hardware (with lid) will do fine, if you cut or drill a hole in the lid big enough for the Wonder Washer handle to fit through. Believe me, it DOES get clothes clean, even sheets and jeans. Now for the wringer. You’ll need 3 buckets that are 5 gal and 1 of them needs a lid. Drill or cut holes in what will be the middle bucket. (Little tip here, you DO NOT need a drill, a good sturdy serrated steak knife and some patience will work fine. All you have to do is cut an “X” where you want the hole. Take knife out and reinsert knife right in the middle of the “X” and then twist a tiny bit to open up the hole. Just make sure the holes open out the BOTTOM so they face the bottom bucket and NOT toward the clothes. ) Cut/drill five holes on the side of 1 bucket down near the bottom, then drill/cut 5 more holes evenly spaced into the bottom of the bucket. Now, the bottom bucket has NO HOLES, the middle bucket has the holes in it, and the top bucket has NO holes. Put the wet clothes in the middle bucket, insert top bucket, put on the lid (if you want to) and push hard until all water is in bottom bucket. This process may take a couple of times to get all water out of clothes but it DOES WORK. If you want a picture just do a Google on “5 gal bucket clothes wringer” or something along that line. I read in Carla Emorys book many years ago and I think she said she herself did her wash a few times in the back of a pickup. I, too, have the wonder wash. My problem is that it won’t stay tight…the handle always comes apart from the plunger part. Anyone else have this issue? It is a big one for me! Plus, I can’t find any where to actually do this where the buckets don’t slide around or are tall enough to do without breaking my back! I usually do it in the tub, but that is low and the buckets slide around and make black marks all over the tub. Using a sink would be too tall. Outside isn’t really an option, summer would be fine, but I’m not going out in the winter! I don’t mind the thought of hard work, but there are real issues about this. What about queen or king sheets? How do you expect them to get clean in a 5 gallon bucket? I use my buckets inside the tub, but I put down a tub mat so they don’t slide around or mar the tub. It works great this way. I used to wash all of my dedicates similar to this using the towel wring out method for drying or line drying to save money on my energy bill. It can be a pain but you waste less money on water and power and you know how to do it if an emergency occurs. I like the three 5-gallon bucket idea with the holes drilled in the center bucket for “pushing” the water out. I am going to try this. I have also been pondering purchasing a (dedicated) mop bucket with wringer on wheels – like this one http://www.amazon.com/Rubbermaid-Professional-Bucket-Wringer-FG728100YEL/dp/B00GJ0Q47S/ref=sr_1_1?s=industrial&ie=UTF8&qid=1436900304&sr=1-1&keywords=rubbermaid+wringer+bucket&pebp=1436900158585&perid=1XBQXWM1D1XHZDKA4ZPY to be used only for laundry wringing. It’s not terribly expensive, I can store other disaster-laundry items inside, tuck it away (after testing it out, of course), and be ready with a mobile drying station in the event of an emergency. Carol, above, asks about cleaning Queen or King sized sheets. In a true emergency, I wouldn’t use them. I’d simply use twin sheets or sleeping bags with sheets as liners, so only the smaller, easier twin sized sheets would need washing. Does anyone know if the Wonder Wash is still being made? I looked for one and everyone, including Amazon, says it is sold out or not available. This Wonder Washer is in stock on Amazon, http://amzn.to/1MQEwQd It’s odd that the Wonder Wash isn’t there. It was when this article was written just a few weeks ago.